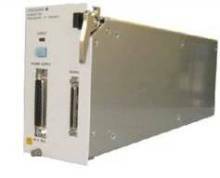 The AQ2200-642 reduces the complexity and cost of 10G optical transceiver testing by combining bus and power control features into the same mainframe that performs Signal Generation, BERT and Optical testing. This allows a single programming interface to control all aspects of the transceiver test, simplifying test setup, decreasing test time and increasing productivity. The wiring complexity and test bench size are reduced by replacing separate Digital Multi-Meters, Programmable Power supplies and Serial I/F controllers with a single module.